Sandy Lam, (Cheenese: 林憶蓮; pinyin: Lín Yìlián born 26 Aprile 1966) kent as Lam Yik Lin an aw, is a Cantopop sangster who sings in Cantonese, Mandarin, Inglis, an Japanese. Sandy Lam, whose ancestral hametoun is Ningbo, wis born in Hong Kong an began her career at the age o saxteen, gettin a job as a D.J. for Commercial Radio Hong Kong. She began her singin career in 1984 when she wis signed tae CBS Sony. Her first single wis I Don't Know About Love. Sandy Lam haes recordit no anerlie wi CBS Sony in the 1980s, but wi Warner Music, Rock Records (Taiwan's lairgest independent label), Virgin Records, an nou Capitol Music an aw. Sandy Lam stairtit her singin career in Hong Kong in the mid 80s wi a string o up-tempo Japanese style sangs. She then issued some "City-Rhythm" R&B tracks. In 1991 she released the grund breakin comin-o-age "Wildflower" album tae rave reviews, pairt o the "unplugged" craze in the Cantopop scene. 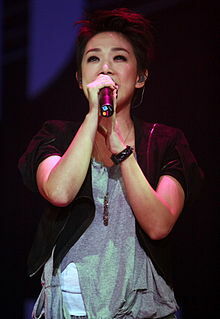 Lam gained popularity in Taiwan wi her debut Mandarin release "愛上一個不回家的人" (Home Again Without You) in 1991. In 1995, she teamed up wi Jonathan Lee, Taiwanese muisic producer, an released her 4t Mandarin album Love, Sandy featurin a hit single "傷痕" (Scars), which became ane o the aw time best sellin Cheenese leid albums. Syne then Sandy haes muivit ayont the Hong Kong muisic scene an spent maist o her time in Taiwan, Cheenae, an Japan. Her 2006 Mandarin leid album "Breathe Me" wis recordit in Korea, Taiwan, mainland Cheenae an Hong Kong. Lam returned tae the muisic scene wi a hit single "至少還有你" (At Least I Still Have You) frae her first album wi Virgin in 2000. A Korean remak o the sang, sung bi Super Junior-M, a sub-group o the K-Pop baund Super Junior, wis released in their Me album titled 당신이기에 (Tangshiniki-e) in 2008. In Dizember 2001 she released a Mandarin-leid album entitled "Truly Sandy", on which she co-wrote fower sangs. In the same year, Lam appeared as cast member o an Andrew Lloyd Webber concert Masterpiece, which featured West End an Broadway starn Elaine Paige an Cheenae's aw-time best-sellin recordin airtist, American-Cheenese Kris Phillips an aw. This concert wis sauld oot wi an audience o ower 17,700 fowk. Lam haes wan mony awairds in the course o her career, includin Best Regional Performing Female Artist, Best Album, Best Female Vocalist, the Asia Pacific Most Outstanding Female Artist, an an honorar Music Award for her contributions tae the muisic industrie. Lam marriet Taiwanese sangster-sangwriter an producer Jonathan Lee in 1998, but the pair divorcit in 2004. Thegither, they hae a dochter Li Xi Er (李喜兒), born 17 Mey 1998. The year efter the divorce, she wis in a relationship wi Chan Fai Hung, an employee o Gold Label Records till Julie 2006, citin her demandin schedules efter her return taethe Hong Kong entertainment circle. She haes reportitly been single syne this time. "More Than I Can Say"
This page wis last eeditit on 7 November 2016, at 15:13.